In riding there is no escaping this compulsory ability... you will often be called upon to sit the gaits, be it at the trot and certainly at the canter. Denny Emerson joins us with the second part of his Rider Fitness series, explaining and demonstrating strategies to achieve an independent seat. The goal is to develop the strength in your core so you can harmoniously synchronize your seat with the moving back of the horse. This takes practice and fortitude but results in the mastering of a skill required of all good riders - a good seat. Equine activities can be hazardous and may subject participants to injury. 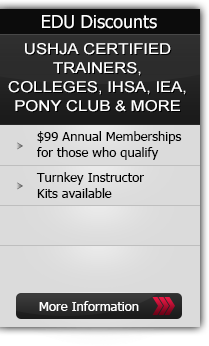 Neither Equestrian Coach, LLC nor Denny Emerson assume liability for your activities. This program provides general instructions and techniques that may not be suitable for everyone. No warranty is given regarding suitability of these instructions to the viewer.